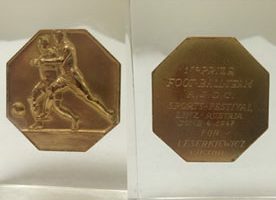 Collection of awards and medals is little-known JDC Archives trove. A little known treasure trove of the JDC Archives is its collection of awards and medals. These decorations exemplify the far reaching global humanitarian work of the JDC while recognizing the individuals who made it possible. 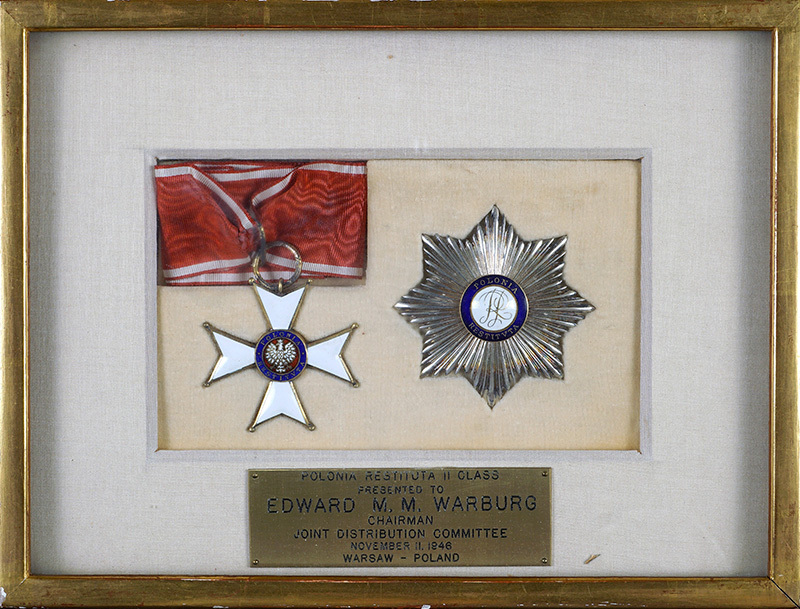 Two prominent examples of medals in the JDC’s collections are that of the Order of the Crown awarded to Laura Jarblum Margolis and the Order of Rebirth of Poland presented to Edward M. M. Warburg. 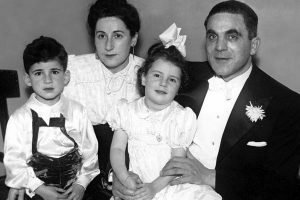 A social worker by profession, Laura Margolis’ career with JDC spanned several decades and continents from working with European Jewish refugees in Cuba seeking asylum in the U.S. in 1939, to directing the relief program in Shanghai in the World War II era, for some 20,000 refugees from Nazi-occupied Europe. After World War II, she was sent by JDC to Belgium to set up a welfare program for survivors and to support homes for children and the elderly. She later served as the Country Director of France before immigrating to Israel where she worked for MALBEN. In January 1947, she was decorated by the Belgian government for her work with the Order of the Crown. A national order of the Kingdom of Belgium, it is awarded by royal decree. 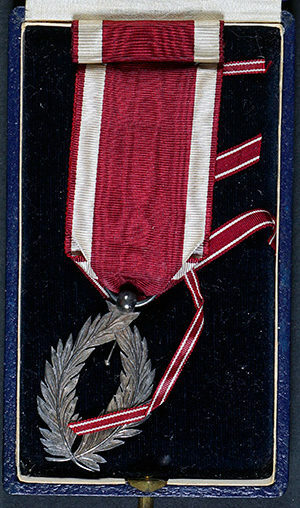 The medal itself features two silver palms descending from maroon and white satin. The Order has been bestowed to foreign nationals and is frequently conferred to military and diplomatic personnel of other countries stationed in, or providing support to Belgium. In the wake of the Second World War, the Order of the Crown was authorized for award to Allied military personnel who had helped to liberate Belgium from the occupation forces of Nazi Germany much as Laura had done. Another example of medals earned from foreign governments is the Order of Rebirth of Poland, or the Polonia Restituta Class II, presented to Edward M. M. Warburg in November 1946 for his work with displaced persons following World War II. Throughout his time at JDC, Warburg worked to secure funds for healthcare, childcare and other humanitarian aid programs for displaced persons and refugees. He served in a variety of leadership roles at JDC: Vice Chairman from 1938 to 1939; Co-Chairman in 1940; Chairman from 1941 to 1943 and 1945 to 1965; and Honorary Chairman from 1966 to 1991. The Order consists of a badge and a star. Dangling from a red silk ribbon with two white stripes, is the badge of the order, consisting of a gold Maltese cross in white enamel. The obverse central disc bears a crowned white eagle on a red background, the Coat of Arms of Poland, surrounded by a blue ring bearing the words “Polonia Restituta” which literally translates to the “Order of Rebirth of Poland”. The star of the order is an eight-pointed silver star with rays. The central disc of white enamel bears the monogram “RP” (Republic of Poland) and is surrounded by a blue ring bearing the Latin words “Polonia Restituta” yet again. The Order of Rebirth of Poland is a Polish state order established February 4, 1921. It is awarded to both military and civilians as well as to foreigners for outstanding achievements in the fields of art, culture, sport, science, national defense, economics, social work, civil service, or for facilitating good relations between countries. Unlike trophies which remain static status symbols, propped upon tables and desks, medals are transportable honors. Meant to be worn on the person, they highlight their owners’ deeds in motion. These badges of honor remind us that the work of the Joint is made possible through of the efforts of individual staff members who put plans to action.